Collision repairers in multiple states might notice some changes at State Farm this year in light of two scheduled office closures and two new restructuring moves reported by Washington and Illinois media. State Farm Petaluma, Calif., and Parsippany, N.J., facilities are scheduled to be closed sometime this year, State Farm had announced in May 2017. Nine other facilities are to be shuttered between 2019 and 2021. All of the 4,200 employees (out of 70,000) affected by those 11 closures “will continue to have job opportunities in other State Farm locations,” the company wrote in a news release at the time. That publicly announced plan doesn’t appear to be the extent of the company’s cost-cutting, however. The Chicago Tribune reported Wednesday that about 890 information technology slots at its corporate headquarters would be cut. The employees could either apply for other departments or 380 of those jobs which will be sent to Atlanta, Dallas and Phoenix, according to the newspaper. The Tribune reported that the Bloomington, Ill., headquarters will add 550 claims jobs — including 250 which were cut from its Tacoma, Wash., workforce. The Tacoma News Tribune in January reported that State Farm would close two Tacoma “call centers that handle claims” employing 1,400. Six hundred of the jobs will be moved to a State Farm location in nearby DuPont, Wash., the News Tribune reported. Besides the 250 jobs sent to Illinois, another 150 positions will be moved to Phoenix, according to the newspaper. Though a spokesman told the News Tribune staffers could apply for other State Farm jobs, the newspaper pointed out that at least 400 net employees might not be working for State Farm anymore. The Tacoma News Tribune in 2013 published a State Farm memo that described the two Tacoma locations as being filled with “Claims Initial Loss Reporting (ILR) and Auto Express operation” employees. Asked about the breakdown of jobs in Tacoma to gauge the impact upon collision repair — how many of the affected employees worked Auto Express, and were any part of the carrier’s “Auto Estimatics” desk and field staff there? — State Farm offered its traditional answer. “We have nothing additional to share with RDN,” spokeswoman Angie Harrier wrote. Auto insurance made up 65 percent of the company’s property and casualty net written premium in 2017. “Profit is and has always been what drives capitalism so yes, SF will continue to pursue it. IMO I don’t look at it like SF doesn’t care about its employees, but rather its end goal. The end goal is not sinking the ship. And if status quo reigns, the ship will most certainly sink. “Now I know many think the way SF is handling things now may indeed sink the ship anyway, but that remains to be seen. I am not sure what “the prize” or golden ticket is going to be, but SF knows what it’s not. Future State Farm closures announced in May 2017 include Irvine, Calif.; Kalamazoo, Mich.; and Tulsa, Okla., sites in 2019. 2020 will see closures in Medley, Fla.; Indianapolis and West Lafayette, Ind. ; and Downers Grove, Ill. 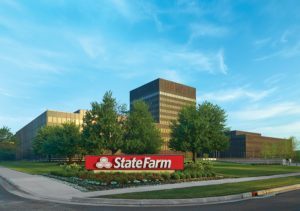 Finally, State Farm will close Bakersfield, Calif., and Frederick, Md., centers in 2021. State Farm financials released last week indicate that the carrier’s auto insurance business made $2.8 billion more in premiums, cut auto claims and loss adjustment expenses $1.6 billion, but ended up $2.8 billion in the red. The carrier’s auto insurance arm lost $7 billion in 2016. Underwriting expenses — which include things like overhead, agents and ads — actually grew by $200 million from 2016’s $10.0 billion in 2017. On the whole, the entire State Farm property and casualty business lost $1.7 billion pre-tax, up from $1.2 billion in 2016.